LOOK at this quilt!!! 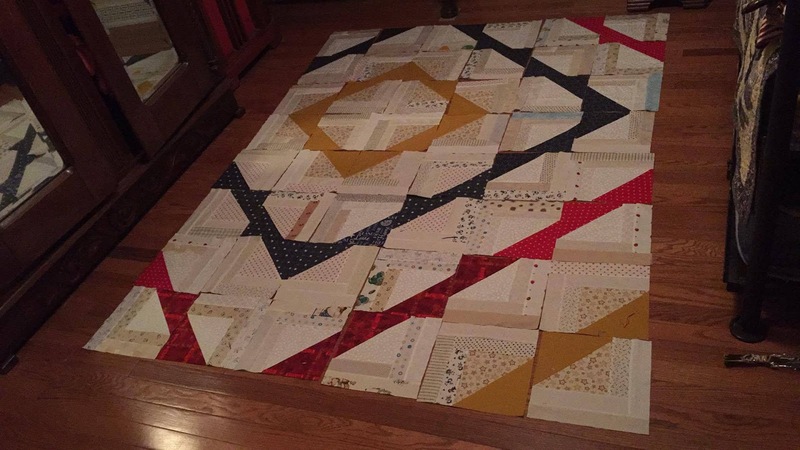 My Client is an Antique Lady and oh man does she find the coolest quilts!! it does not lie flat anywhere!! But we are both okay with that - the beauty of it far far far outweighs it's flaws!! Alright - I'm done bragging - ha ha!! 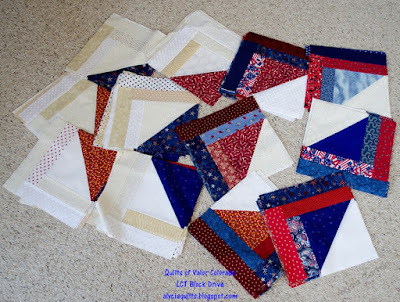 I started even another project this weekend - I am having WAY to much fun sorting my scraps now! 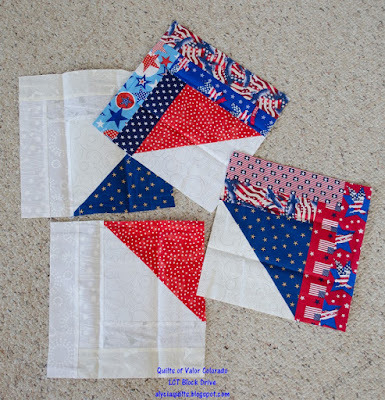 These are blocks from the Wonky Star Block drive - but they were boo boo's as they were too big. So!! There are enough strips here to probably make a baby to lap quilt size quilt..... 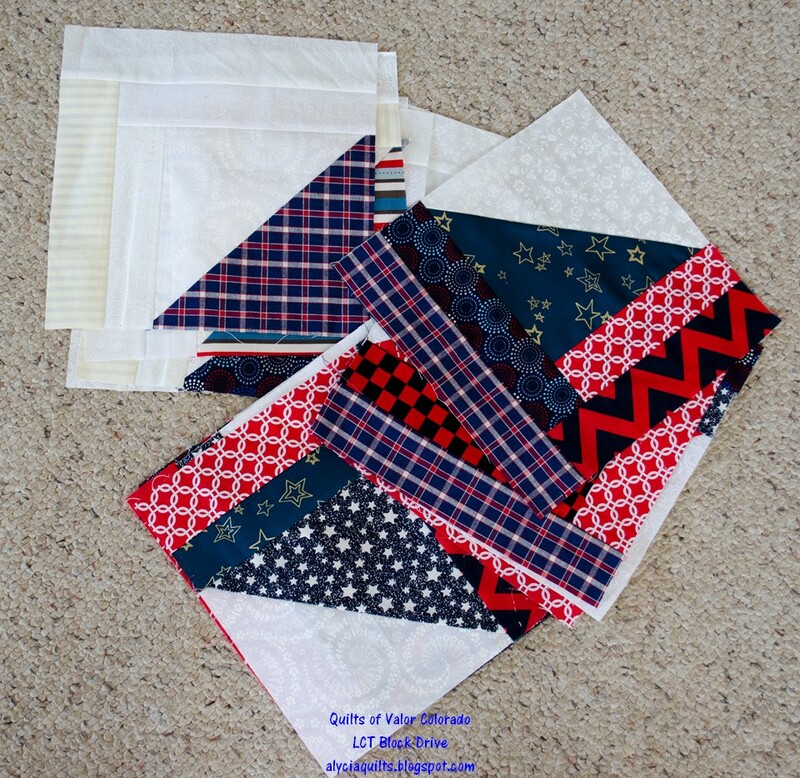 I say probably - because my ability to measure how much fabric it takes to make a quilt is really off.... as evidenced by the growing size of my stash - ha ha!! So just like last saturday - if you want them - leave me a comment, if there is more that one person I will draw on Monday Morning early and contact you so they can wing their way to you! I love Mystery Quilts!! I love to Write them and I love to participate!!! Bonnie at Quiltville just announced the color choices for this Years Mystery - EnProvence!!! and I are doing it in Patiotics!! Kevin always does them that way - I've only done 2 that way... but with his encouragement I'm doing it again!! 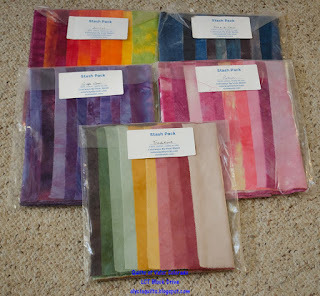 Here are my Fabric Choices!!! 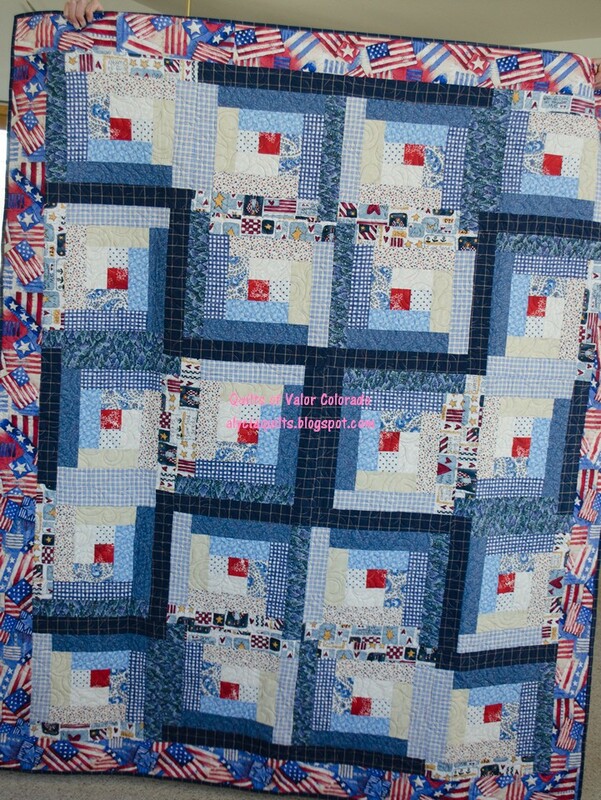 Mystery Quilts 4 Military we are moving on to Clue #4 of the current Mystery!! 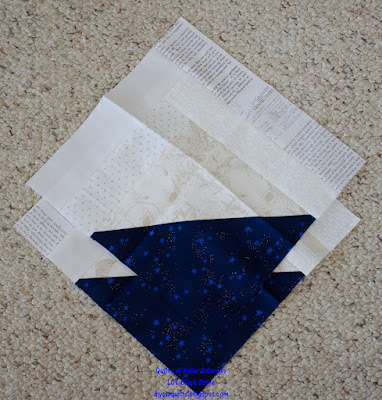 I have used up a lot of scraps on this one - however.... I keep finding more scraps - HOW!! Does this happen? I swear I try to stay on top of them - but at least I can put them to good use!!!! About 5 years ago I met the Softball coach from the local University - and we got to chatting. She was telling me that the Team needed to do Community Support Work, and of course I said - hey - They could work on Quilts of Valor with us.... and the tradition has continued!! They came and joined us at our sew day and dug in to making the QOV CO block Drive Blocks!! 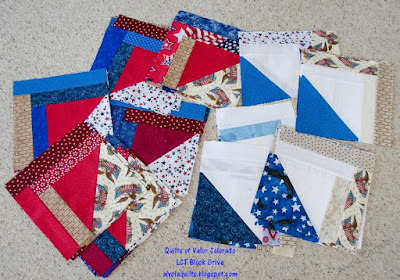 I had all the half squares pre-made - just thought that would be easier, and had all the 2 inch strips cut. I drew the directions up on the Board .... sort of made me feel like a teacher - ha! And away they went. There were only 4 new players this year - so only 4 new people to teach how to work the machines - and Bam!!! They just got to work!!! I told them - have fun, don't worry about how many you make, just enjoy!! we wanted them to feel at home! Then one of the girls yells - those with the most blocks wins!! And my goodness did they get those machines cranking!! and a stack of 10 that needed one more log! Found Fabrics... Now what to do??? When cleaning up some of my projects in motion ( sort of, I am not admitting to a stalled out stage yet) I found a little bag stuck in there - so I pulled it out, and took the fabrics out and Look!! There are 14 FQ's of the creams on the top of the photo, and 14 FQ's of the maroons, greens, blues and blacks. 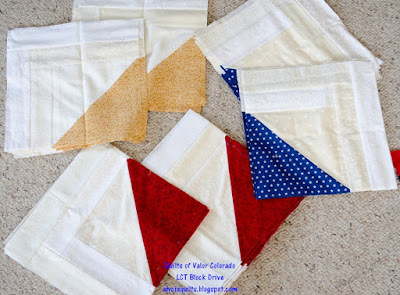 On the left - there is a yard of each of those - there are the Kansas Troubles fabrics. 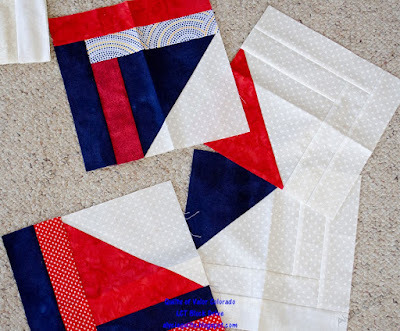 Scrappy Saturday... and Scraps for you!! If there is more than one person interested... I will draw for it on Monday morning and email you to get your address, so that Tuesday when I go to town - it will be winging its way to your scrappy little heart!!! I had a client call and she was just so sweet. 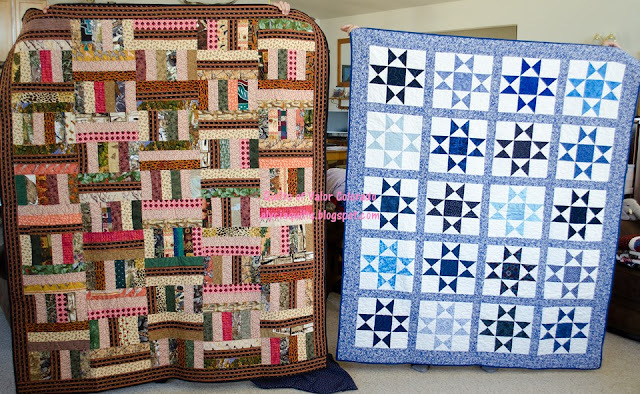 She loves to embroider - but had never made a quilt. 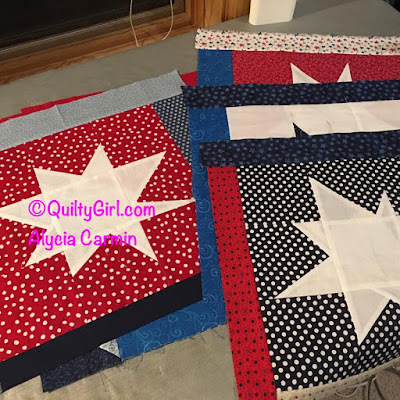 So she asked if I could help her finish one with the most adorable blocks!! Quilts of Valor - More Blocks! I think that fall is in the air, and maybe winter isn't so far behind. But if you would like to put a hold on the snow - I am okay with that for a bit. We still have a bit of winterizing to do ( and animals to move) so it can hold out!! Today I am going to show you a ton of awesome Blocks that are coming in for the Block Drive! 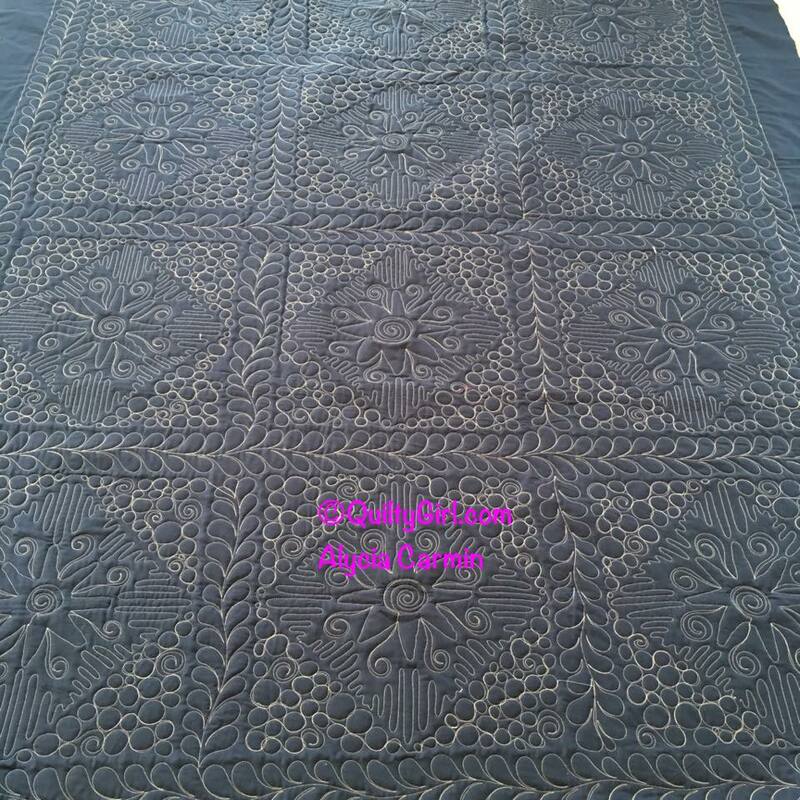 It is so fun to see where they come from, and .... the fabrics!! I swear I feel like I haven't seen some of these before - so I should go shopping right??? Seriously Jeanne - hope all is well for you!! Don't you just love that these come from all over!! and Thanks to Colorways by Vicki for FIVE Stash Packs!! I have high hopes of reducing another 2 inch strip bin! You can vote everyday - and you know I am that mom - ha ha!! Today I am going to show you Quilts!!! 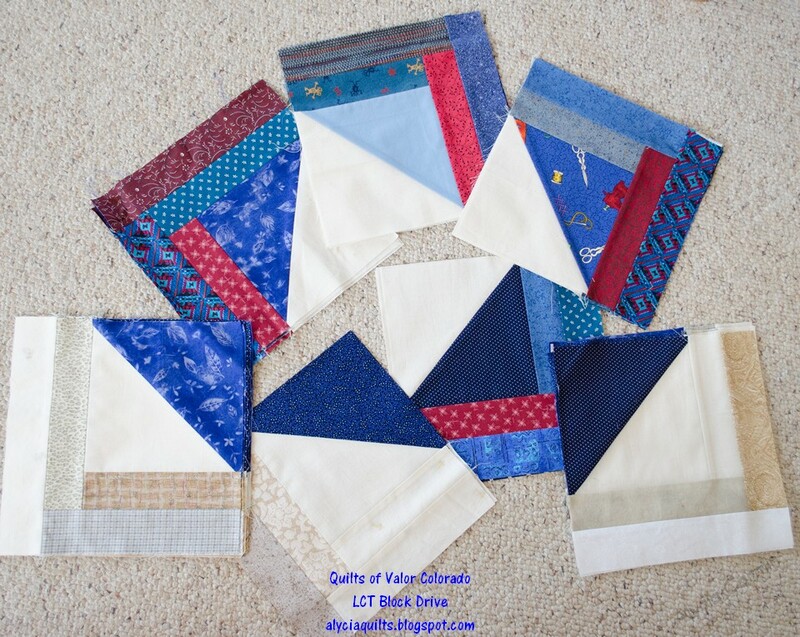 Quits of Valor - because I like to brag on our Quilters!! She Pieced and quilted them!! Have fun checking the links!! And enjoy your Wednesday!! Sometimes I love the back of the quilts SO MUCH - I forget to take a photo of the front!!! These are the backs of the last two client Quilts that I finished!! 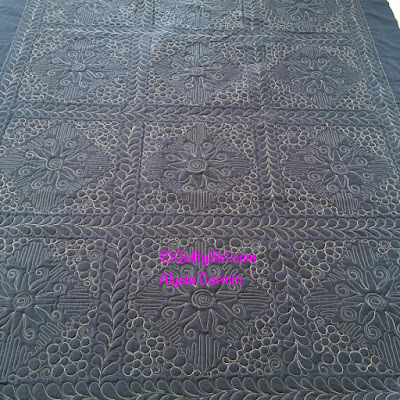 Isn't that texture just so much fun??? I loved looking at it in the sun!! This one was fun too! The front is all Pinks and Light Blues . Oh what fun it is to open my mail!!! 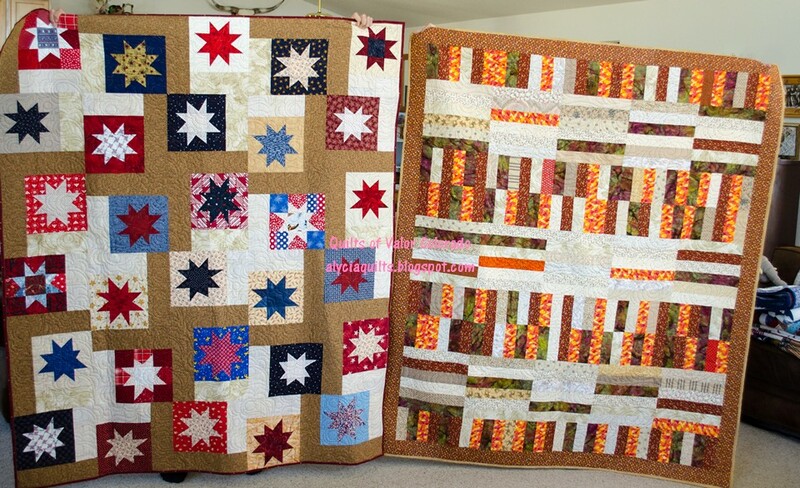 And what fun it is to see people posting their blocks!! Yay!! 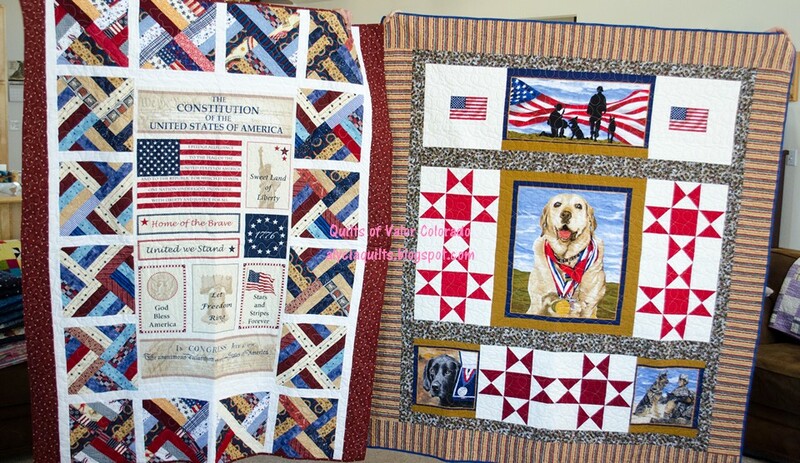 First Off - this is a great presentation that Karol did and her Veteran was just so surprised!! 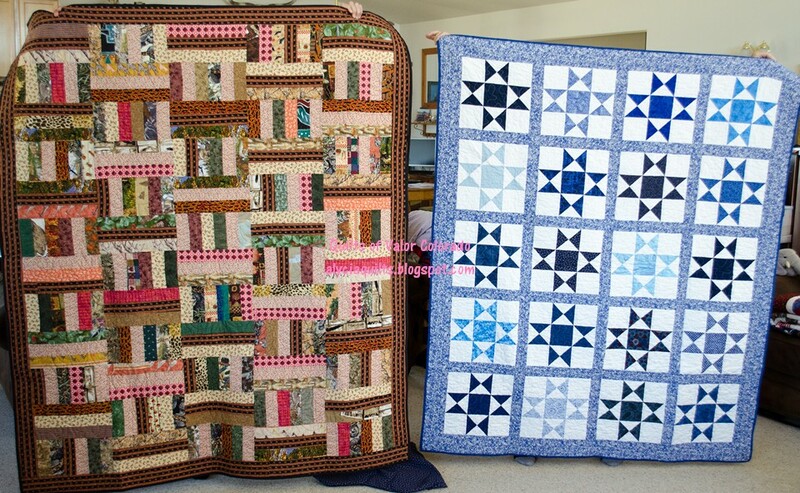 I would be in shock too with a Quilt like this!! Isn't that just amazing! Thank you Karol for honoring this Veteran for his service!! And Showing him the love!! The Blocks - lets show you a few that have arrived!! From Cindy C in NC!! She blogs at Quilting Jet Girl and has some really cool patterns! Now remember!! There are Prizes!!! These are the latest Prizes to be added to our Block Drive!! 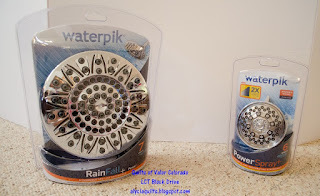 For every block sent in you are entered into the drawing - there is a chance to win one of these awesome shower heads from WaterPik . WaterPik has been a wonderful supporter of our Block Drives so I love to support them,. Not only do they have these awesome, easy to install Showerheads - they carry a great line of Water Flossers. ( PS - this is me talking now- not their PR rep) After having 3 boys in braces - two times each... 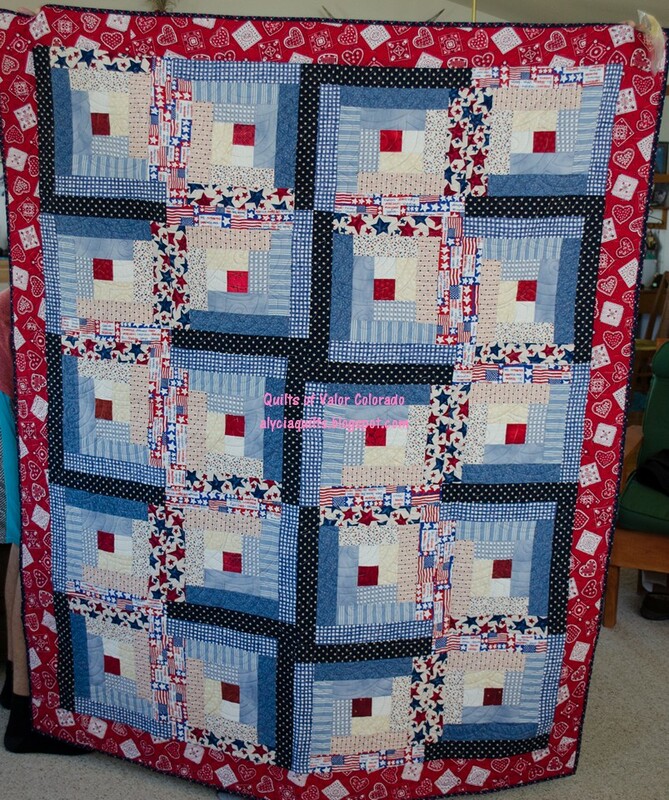 YES people - that is why I have to quilt - stress relief!! We have had only 1 cavity between the three boys - Can you imagine that?